I keep a pretty full pantry (to say the least). I love to have a variety of oils, vinegars, grains & nuts on hand… but every now and then “on hand” becomes completely out of hand. This little sauce came about one day when I was cleaning out my shelves and found five separate stashes of hazelnuts. Some were newly purchased, some were tucked waaay in the back. Also, back beyond my immediate reach was a still-pretty-new-yet-forgotten-about jar of tahini. 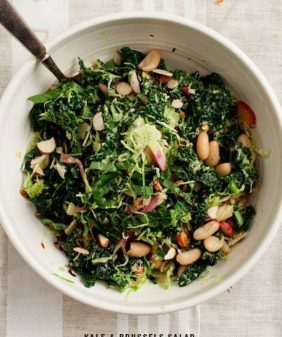 I had pasta noodles to use up, but this would be great as a dressing drizzled over a farro salad, or over greens with roasted sweet potatoes. It doesn’t puree as smooth as cashew-based sauces (and it’s definitely not pretty). It’s a bit on the grainy side, but has that nice tahini tang and also a bit of sweetness from the hazelnuts. 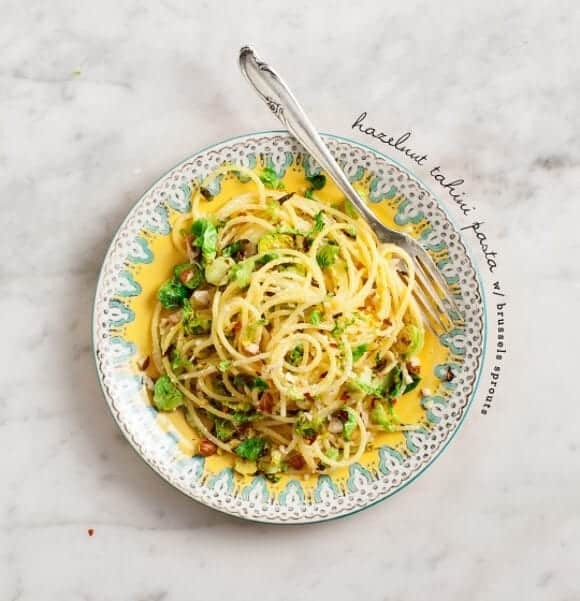 You may have noticed already, but this recipe was posted as a little L&L feature over at the The Chalkboard last week. Toast your hazelnuts well. (In a 300 degree oven for 15 or so mins, or in a skillet for about 5). Make the sauce by pureeing the hazelnuts, garlic, tahini, lemon and olive oil in a high speed blender. Drizzle water, as necessary to get your blade moving. Add salt and pepper to taste. In a large skillet heat olive oil. Add the shaved brussels sprouts into the skillet in one layer (you might have to work in batches if they don’t all fit). Add a pinch of salt and pepper. Let them cook for a minute or so (until they begin browning), and flip. Cook for another couple of minutes until the edges are golden. Remove the brussels sprouts from the pan and toss them with the pasta and as much or little sauce as you like. Add a little pasta water, as needed, to create a creamy sauce. Top with toasted hazelnuts and a pinch of red pepper flakes. Taste and adjust seasonings. Raw cashews, walnuts, or blanched almonds can be substituted for the hazelnuts. I used quinoa noodles but use whatever pasta you like. This pasta looks and sounds so good!! Love the flavour! I love these little clear out cupboard/fridge meals. They are the best, love the sound of the dish. So fresh and perfect for spring. Pinned! I think it would also be perfect on spiralized carrot or zucchini “noodles”. Gonna try that :D! it would be – yum! i have that hoarding problem with cashew nuts recipe..I have been eyeing your stuffed cabbage though. I have the same little stashes, although mine seem to be almonds… sliced, blanced, whole… they are everywhere. I also always have an open jar of tahini, and oddly enough, I always seem to have Brussels sprouts… I’ll definitely be making this soon. Thanks for sharing! This looks so wonderful! 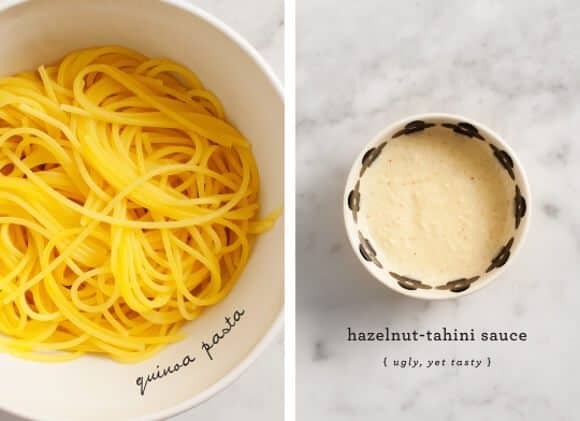 I’ve never thought of pairing hazelnuts and tahini, but I bet it’s so super tasty! I have everything but the sprouts on hand…since they’re my favorite veggie they are eaten pretty darn quick around here 😉 Guess I need to go to the store! Unique recipe! Will try soon! Oh I know ALL about an out of hand pantry. The nuts are the craziest, especially with me experimenting with nut butters and nut milks over the past month or so. This looks absolutely incredible. As usual!! Love tahini so I’ll have to try this soon & it’s vegan! How delightful! 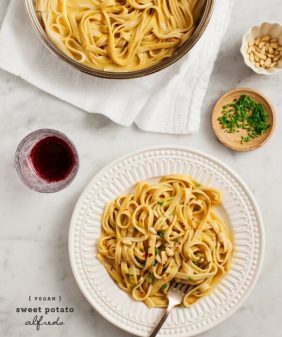 This looks so great – I love a simple and healthy pasta recipe. And anything with roasted hazelnuts wins me over. Fortuitously, I have all these ingredients on hand! Also that bowl the pasta is in is super pretty. strapless gown and it lifts your bust and tucks your waist. are just as important as the dress. I’ve love to make this soon! My daughter just discovered a love for Brussels sprouts and would devour this! So would I, of course. Such an unusual combination… Going to have to try it. I think I, too, have some tahini banging around at the back of the fridge! Love the sound of this. Just finished up the last of some tahini in a collard salad last night, and am already desperate to go run out and get more. 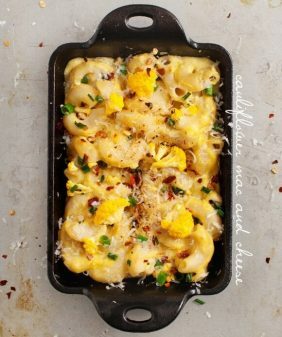 I love how it’s really taking off everywhere in such beautiful recipes like this. I love this pasta! It’s SO unique. I love all the flavor profiles and the brussels sprouts! Very creative – can’t wait to try this! I didn’t even know quinoa pasta existed! 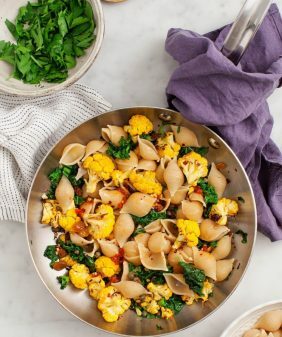 I guess I am not surprised though 🙂 I usually use corn pasta because it seems to be less mushy than brown rice pasta, but I will have to be on the look out for quinoa pasta! Sometimes some of the ugliest foods are the best! This looks amazing and so creative ! Can’t wait to try it . Sending hugs ! I love the recipes that come together when you think you’re making something out of nothing, or leftovers or whatever is left in the pantry! This looks delicious and uses some great ingredients in an interesting way. Can’t wait to try this, thanks for the inventive recipe! Ugly, yet tasty! Haha, that’s the perfect way to sum up tahini. Quinoa pasta has THEE best GF texture. So so good. This creamy sauce sounds outstanding and so simple. Always love your creativity. Wishing you luck with Saveur! I’ve been subscribed to your site for ages now and no idea why I haven’t commented! 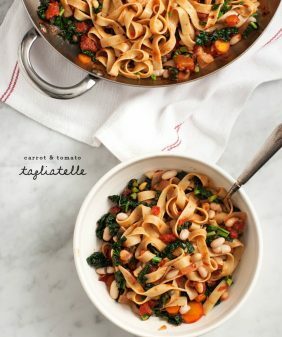 I love this pasta idea especially with using up ingredients; a process I’m going through myself right now! The tahini sauce sounds divine! This looks so delicious! 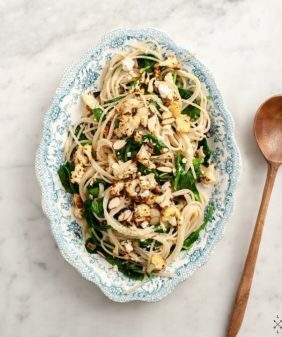 Love the idea of the hazelnut tahini sauce–must try this. Just tried a rendition of this. I subbed quinoa pasta for corn pasta and I used fresh avocado slices on top instead of Brussels… It was delish!!! Such a simple easy meal to make. Thanks for the great recipes! sounds delicious, so glad you liked! OMG the quinoa “pasta” looks delicious. This looks heavenly! Such great presentation also. I must try! I’am Chantal from Travelling Papilles. I just discover and like your nice blog! This recipe is really original, I’ll give it a try. So excited to try this recipe as I am gluten-free and this is such an easy clean recipe. Thanks so much for sharing!! This was great! i would put WAY more brussels in next time — but i do love a sprout! I’m glad you enjoyed it! Thanks for the feedback!